Get the latest drivers and install them. It should find a driver for that unknown device. I would download the newest drivers but not install them. Then I would boot into safe mode and remove the unknown device, sound devices and network adapters in Device Manager. Then I would reboot in Windows normally and let it find the devices again. I would then update the drivers as needed. If that doesn't work then we need to find out what the unknown device is as it's probably causing all of your problems. Go into the bios and disable the built-in devices one at a time until the unknown device disappears. Once we know that we can decide upon your next best option. the latest drivers for the sound devices? is that board XTD, not TXD? ASUS doesnt have a TXD model. VIA Drivers Download - VIA Technologies, Inc.
Weird that the drivers are ATI, when it is VIA.. If the speakers were working fine earlier I don't know why they would get uninstalled. Check to make sure they are still default, right click on the speaker on the system tray and then click Playback Devices. It should show a list of playback devices (ATI HDMI Output, Speakers, Headphones, Digital Output, etc). Make sure the right output is set as default. 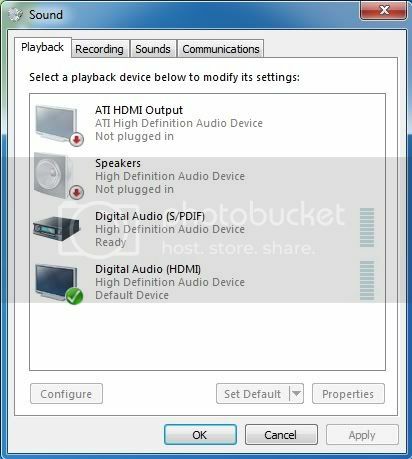 Sometimes you may connect a device that has audio capability or use the HDMI port and it will use a different sound device and never set it back. Make sure your speakers is set to default (or whatever device you want to use). What is "USB Audio Device"? Chances are that when you connected this audio device the PC switched from the speakers to it. Since "High Definition Audio Device" is listed as installed I think your sound card should have at least basic drivers that work. Try these if the drivers at Asus don't work.